Item description: Entry, dated 29 April 1861, from the diary of Mary Jeffreys Bethell reflecting on war news and commenting on her sons’ enlistment in the Confederate Army. Item citation: From the Mary Jeffreys Bethell Diary #1737-z, Southern Historical Collection, The Wilson Library, University of North Carolina at Chapel Hill. Since I wrote a change has taken place. Civil War has begun, a bloody affair at Baltimore on the 19th, South Carolina took Fort Sumpter, and several men killed on the enemy’s side. The slavery question is the cause of all this trouble, 8 Southern states have seceded from the Union, if the North and South can’t agree, they had better separate. Abraham Lincoln the President is opposed to the institution of slavery, he don’t seem disposed to make any compromise with the South. The Southern people are raising a large army to defend their Country and their rights. Nearly all the young men of our Country have volunteered to go into the army. My dear son Willie is a volunteer, and if necessary will go to aid in fighting for his country. I expect my son George will go too, it makes tears flow from my eyes to think of it, but I shall commit them to my kind Saviour, I hope and trust in God that they will get back home from the battle field, but if they should fall, I hope that God will forgive them and take them to Heaven for Jesus sake who died for them. I feel very solemn today thinking about the war, I hope God will give me grace to bear all the trials that are coming upon me, it is my fervent prayer that God will convert all of my children, and take them to Heaven when they die. Oh Lord have mercy upon us all. The collection is the personal diary of Mary Jeffreys Bethell of Rockingham County, N.C. The first part of the book contains short reminiscences of her immediate family. 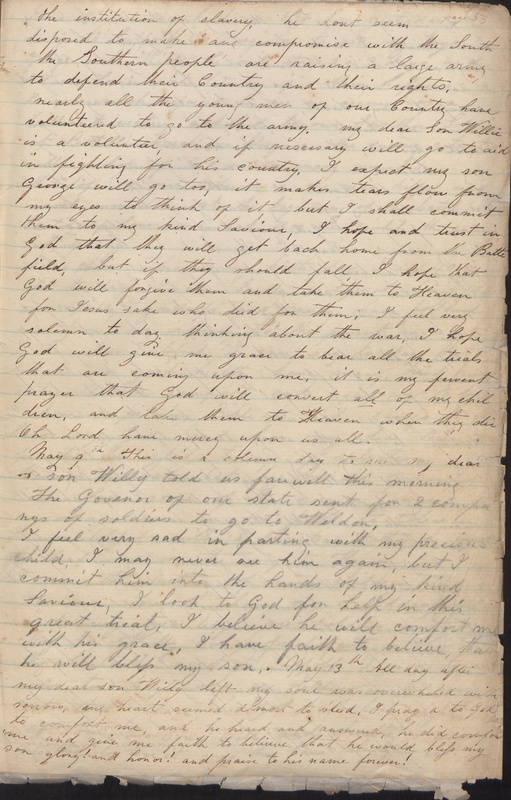 After her marriage in 1840, the diary contains entries relating to her home, neighborhood, the Methodist Church, constant religious activities including camp-meetings, her children, several of whom died young, and the Torian children, whom she referred to as nieces and nephews, and who lived in the Bethell household for years. There is frequent mention of journeys with her husband to Louisiana, Tennessee, and Arkansas, with the possible intention of moving the family, and her negative reaction to the idea. During the Civil War, there is mention of her sons Willie and George entering the Confederate Army, and of news and visits from them. George, in the 55th Regiment, North Carolina Troops, was captured and imprisoned at Johnsons Island. Mary’s husband entered the army in 1864 and she wrote of the difficulties at home after he left, including the departure of slaves. There are also reports of rumors and news of the fighting. After the war there are references to social conditions, difficulties with servants, etc. 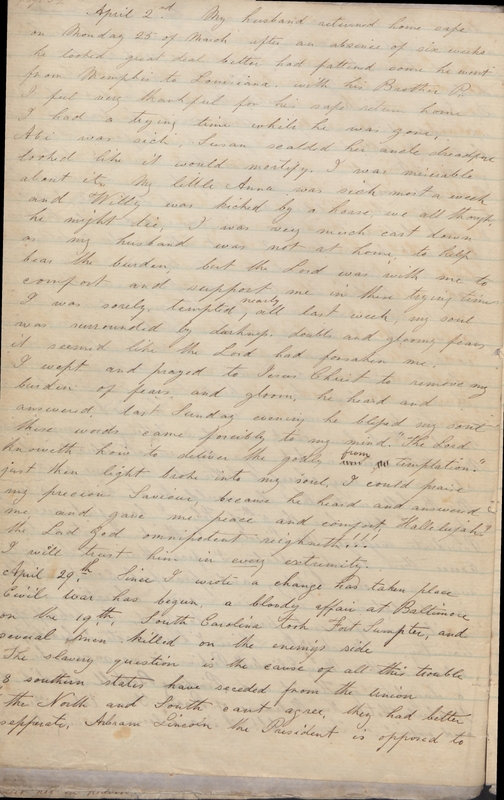 This entry was posted in Southern Historical Collection and tagged Abraham Lincoln, diaries, Mary Jeffreys Bethell, mobilization, North Carolina, Rockingham County, secession, women. Bookmark the permalink.